Fields Development Group has added yet another residential building to its long list of overwhelmingly successful Hudson County communities. 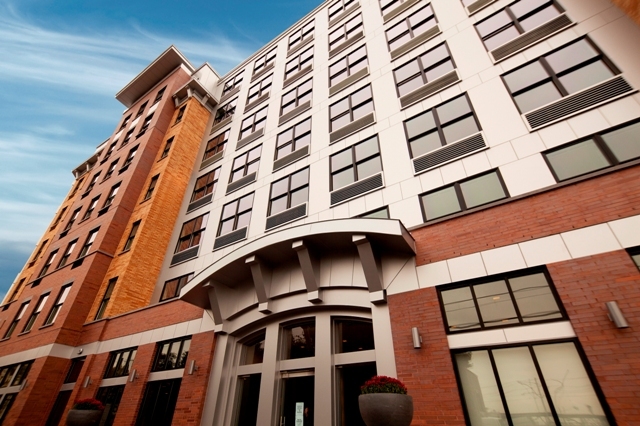 The Hoboken, NJ-based developer, which has been recognized for some of the most notable mid-rise apartment and condominium buildings in Cities such as Hoboken and Jersey City, is reporting the complete lease up of Madox, its latest upscale rental offering located in Jersey City’s historic Paulus Hook. Fields Development Group reached the impressive milestone less than a year after the collection of 131 luxury apartments opened to the public. Designed as the first “green” residential building in Jersey City, Madox received its LEED® Silver certification from the U.S. Green Building Council (USGBC) earlier this summer. “Madox was planned to be a rental building unlike any other available in this market,” says James Caulfield, Jr., a Fields principal. “During every step of the design and development process our staff worked diligently to create a building that distinguished itself. Madox ‘s homes feature fixtures that conserve energy, increase water efficiency and improve air quality. The building’s largest amenity, its expansive rooftop deck, is also the feature that most vividly illustrates Madox’s “Green” focus by presenting a large outdoor recreation area for residents while also controlling storm water runoff and generating renewable power with PV Solar Array panels and green roof vegetation. Additional sustainable elements include electric car charging stations, and building systems to reduce water consumption by over 45% and energy consumption by 14%. The building will also be under contract for at least two years to provide 35% of its electricity from renewable sources and is 100% smoke free. Other green aspects of the building are consistent with responsible urban development, including a location within walking distance to several mass transit options including PATH, Light Rail, NJ Transit Buses and NY Waterway Ferry, hosting two vehicles in a car share program, bike storage, electric car charging stations and community connectivity with walking distance to parks, shops, schools, library, fitness center, hospital, banks, churches and restaurants. Located directly next to the Bergen-Hudson Light Rail, Madox fills the gap of the property’s former industrial use with an attractive residential address that creates a continuous streetscape along tree-lined Van Vorst, Morris and Essex Streets. Fields Development worked closely with the Historic Paulus Hook Association to ensure the building’s exterior blended with the existing neighborhood. Consistent with its green goal, Fields Development Group utilized recycled materials and reclaimed wood that promotes Madox’s feeling of old charm and comfort. The end result was a classic multi-toned façade that reflects Paulus Hook’s classic look, yet provides a modern flare. Fields Development Group has also repaved sidewalks around the building and planted trees to create a comforting environment. What’s more, a minimum of 50 garage parking spaces in Madox will be offered to local residents to reduce the amount of demand for street-parking. Madox will bring additional services and stores to Paulus with two state-of-the-art and modern retail spaces. The prime street-front spaces can accommodate a wide range of business types. One space – a 1,550 square foot suite located directly on Van Vorst Street — is ideal for a restaurant or café with outdoor seating and pre-installed duct work that can specifically equip an eatery. The second 2,060 sq.-ft. space offers a highly visible location on the corner of Van Vorst Street and Morris Street. Parking will be available via the building’s on-site valet garage. Madox residents also enjoy a host of onsite modern amenities and services, including a keyless entry system, 24-hour doorman, state-of-the art gym, a lobby lounge with a library, business center and communal technology table with iPad Station, iMac and PC; and a resident’s-only lounge with children’s play area, kitchenette, two TVs and more.